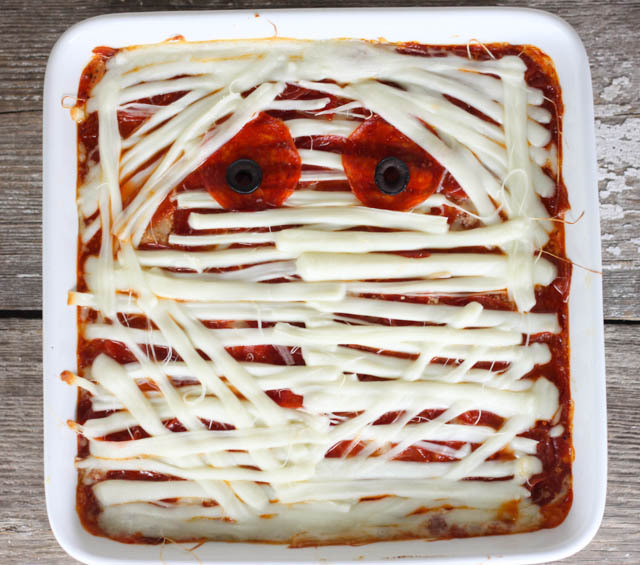 Are you looking for a fun appetizer for Halloween? 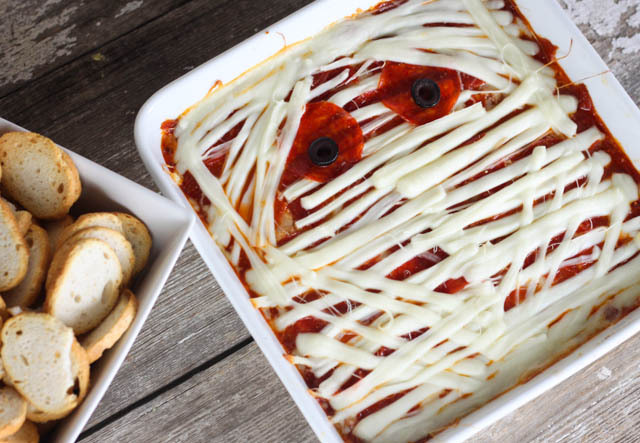 This Mummy Pizza Dip will be a hit with your ghosts and goblins! 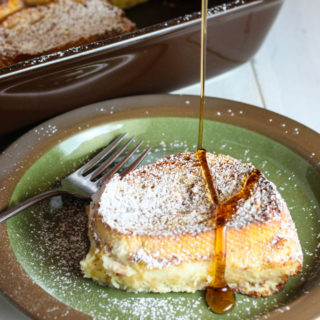 This recipe was modified from the Gooseberry Patch Homemade Harvest cookbook. 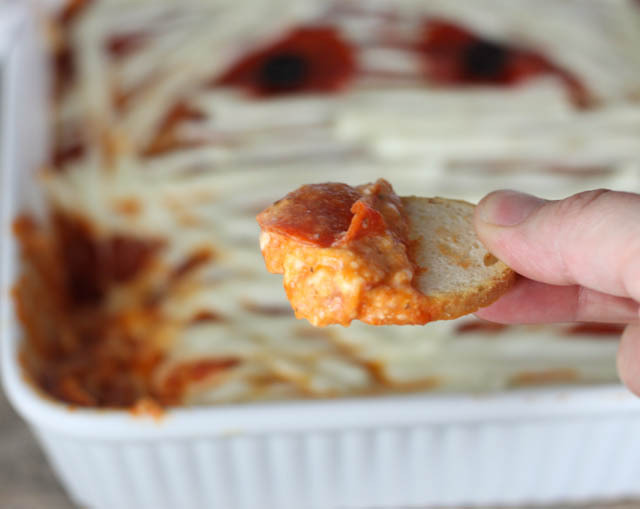 Halloween evening is crazy busy and this dip is the perfect after school snack or quick meal. We live in the country so we don’t trick-or-treat in a subdivision we drive to our stops and usually stay a while at each one. We need a snack/meal that will fill up my goblins so we don’t have any meltdowns! 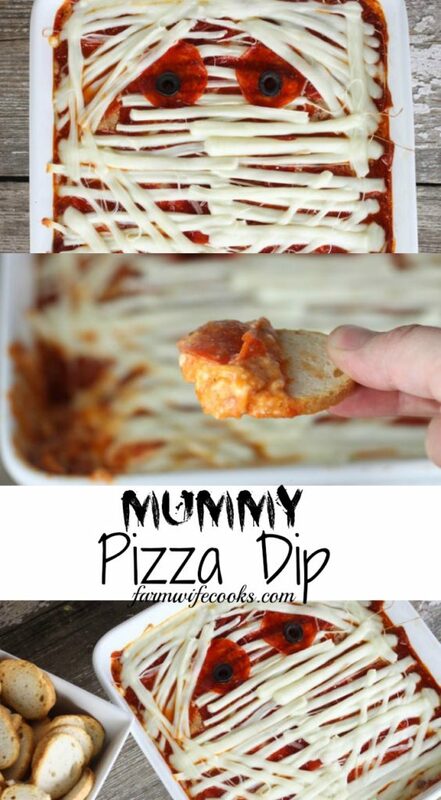 This dip is perfect for that! 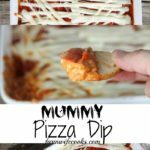 I love that this dip uses ingredients I normally have in my kitchen and ones that I know my kids will eat! Mini pepperoni would work great in this but make sure you still have two regular size ones for the eyes. Green or black olives work great to finish off the eyes. 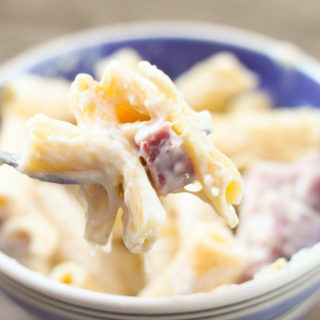 You can make year round by ignoring the part of the recipe that involved the string cheese. Enjoy with crackers or toasted baguettes! Blend together cream cheese and seasoning and spread on the bottom of an ungreased 9"x9" pan. 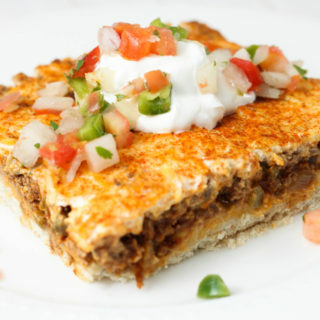 Combine the cheeses and sprinkle half over the cream cheese mixture. Spoon on pizza sauce, spreading to the edges. Sprinkle with green peppers and diced pepperoni (reserve 2 pepperoni slices for the eyes). Top with remaining cheese mixture. Place the pepperoni slices at the top of the pan for eyes and add the black olives. "String" the cheese and place all over to make the mummy wraps.